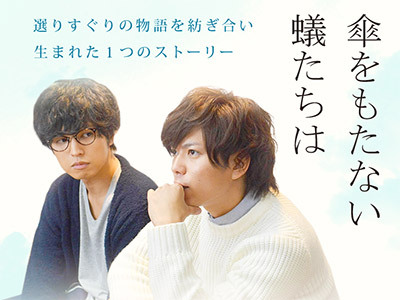 "Ants Without Umbrella (tentative)" is a live-action drama based on a collection of short stories written by actor Shigeaki Kato, a member of Johnny's idol group NEWS. The protagonist of the drama adaptation is a 30-year-old, unsuccessful sci-fi writer named Jun Hashimoto (Ren Kiriyama). Unable to publish any successful books, Jun lives off through his meager savings. One day, Jun is asked by his editor to write a "love-themed" short story for an online magazine targeted for young readers. Jun refuses at first since he has never written a love story before, but is convinced to take the job. Though the deadline was quickly approaching, Jun was unable to put on paper any words. One day, his childhood friend Keisuke Murata (Shigeaki Kato) stops by for a visit. While talking to Keisuke, Jun remembers an episode from his past which leads him to come up with an idea for his love story titled "Intercept."